IT'S TIME TO STRIKE BACK. The anything-to-survive existence of Ellie and her friends has sharpened their senses and emboldened their plans. They aren't merely on the defensive anymore - they're also fighting back. Their strategy? Attack the enemy not just on land, but also on water. If they have any hope of sabotaging the formidable containership at Cobbler's Bay, then they'll need stealth . . . and one very big explosion. And if they fail, they may face a whole new kind of terror - imprisonment. This book affected my very strongly the first time I read it - as soon as I finished, I went back to a certain scene (you'll know which one if you've read it too), cried my eyes out, and was pretty much useless for the rest of the day. This time was different. I cried a little bit, but mostly I just lay in bed thinking about what had happened and how I would handle that type of situation. It was a long and sleepless night. 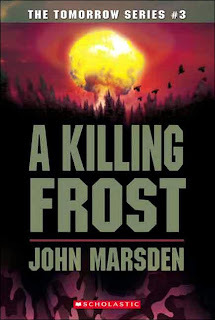 Marsden certainly knows how to throw his characters from the frying pan into the fire. The group finds success, catches a glimpse of hope, then is knocked down again when they least expect it. Their experience is full of dwindling hope, boundless fear, and senseless tragedy. 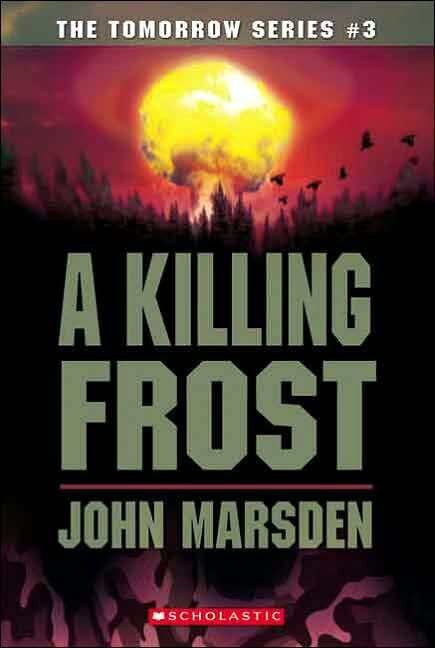 A Killing Frost was originally the end of the series, but thankfully Marsden felt the need to return to Ellie and co., so there are four more books tacked onto the end of the original series. If this had been the end of the story, with no more books to come, Marsden would have received some very unhappy fan mail from me! As it stands, though, I need to take a short break from this series and go read something mindless and happy. Then it'll be back to the battlefield.